As can be seen from these extracts from interviews with veterans, joining one of the Surrey regiments was often more a matter of luck than judgement. Potential recruits, with ambitions to join the cavalry or their father's regiment, frequently found their desire thwarted. Conscripts had even less say. Initial training was hard, monotonous, physically demanding and designed to instil routine discipline and obedience. The first day in the army for new National Servicemen. Henry Barker of 1st Battalion, the Queen's Royal Regiment, recalls how he came to join the army in the 1930s despite being under age. John Kershaw of 1st Battalion, the Queen's Royal Regiment, recalls how confusing a lamb for a horse led to his joining the Queen's. Toby Taylor of 1st Battalion, the East Surrey Regiment, recalls the qualities a prospective officer was expected to have between the wars. How Cliff Martin, of 2nd Battalion, the East Surrey Regiment, was persuaded the East Surreys were the regiment for him. 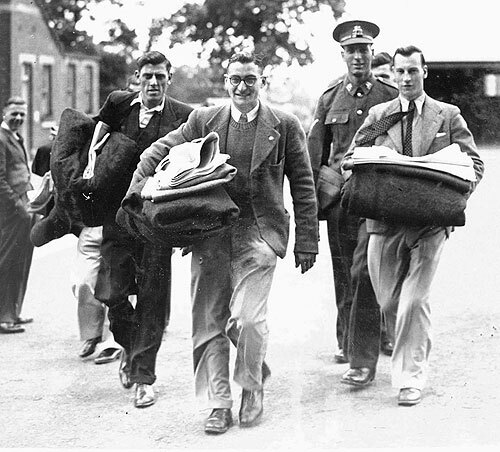 Sydney Bowbrick of 1/5th Battalion, the Queen's Royal Regiment, tries to avoid conscription by joining the Territorials with World War II looming. Jim Jeffery, of 2/5th Battalion, the Queen's Royal Regiment, recalls offending the locals as a young recruit in Guildford before World War II. Charles Sharp of 1st Battalion, the Queen's Royal Regiment, recalls his journey to India and his disgruntlement at becoming a Queen's man. Stan Blay, of 2/6th and 2/7th Battalions, the Queen's Royal Regiment recalls a lucky encounter after his call up in 1942. Roy Harding of 1st Battalion, the Queen's Royal Regiment, and the Royal Fusiliers, remembers being knocked into shape as a national serviceman after World War II. Cyril Dwight of 1st Battalion, the Queen's Royal Regiment, recalls how the pay of a national serviceman persuaded him to join up. Eric Reeves recalls how he came to join the Queen's as a Territorial before World War II despite falling short of the height qualification. George Crook, 1st Battalion, The East Surrey Regiment, remembers his call up for national service and how his choice of destination came to nothing.